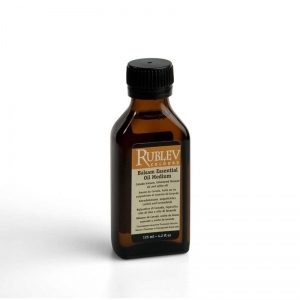 Rublev Colours Balsam Essential Oil Medium is composed of Canada balsam, pale bodied linseed oil and spike oil. Add to oil paint for enamel-like effects (gloss and greater color saturation), to achieve glow in glazes and to facilitate fusion of the colors and brushstrokes. Add a small amount of Balsam Essential Oil Medium to your paint to make it brush out more eas­ily, adhere bet­ter to pre­vi­ous layers, and dry more quickly. 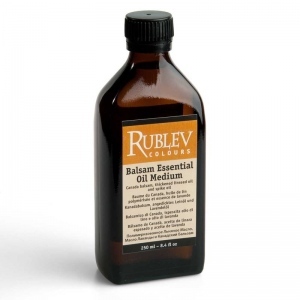 Balsam Essential Oil Medium can be thinned with spike oil or turpentine. Mixed directly into paint on the palette, it gives colors a flowing consistency yet dries to a satin to gloss finish, depending upon the amount used. Balsam Essential Oil Medium smells wonderful. Rublev Colours Balsam Essential Oil Medium is an excellent substitute for Ralph Mayer’s glazing medium described in his handbook, The Artist's Handbook of Materials and Techniques, which is a medium composed of stand oil, damar varnish, and turpentine. Balsam Essential Oil Medium is a 44% weight to volume solution of Canada balsam in bodied linseed oil and lavender spike oil (44% w/v resin solution). Canada balsam is a turpentine made from the resin of the balsam fir tree (Abies balsamea) that grows in boreal North America. The resin, dissolved in essential oils, is a viscous, sticky, yellowish liquid that becomes a transparent yellowish mass when the essential oils evaporate. Canada balsam becomes amorphous solid upon drying. Since it does not crystallize with age, its optical properties do not deteriorate. This volatile resin improves adhe­sion from one paint layer to another and imparts a silky smooth qual­ity to paint. Canada bal­sam is clearer and faster-drying than Venice turpen­tine. Balsam Essential Oil Medium contains the palest bodied linseed oil to provide greater leveling and flow out and better drying properties. Balsam Essential Oil Medium contains lavender spike oil. Spike oil is an essential oil obtained by distillation of the flower spikes of the herb Lavandula latifolia or other related species. It is a solvent commonly used in oil painting by European old masters. For instance, Francisco Pacheco mentions the use of spike oil in his book Arte de la pintura (1649). It is composed primarily of linalool (51%) and linalyl acetate (35%) but also includes other components found in turpentine, such as α-pinene, limonene, 1,8-cineole, cis- and trans-ocimene, 3-octanone, camphor, caryophyllene, terpinen-4-ol and lavendulyl acetate.